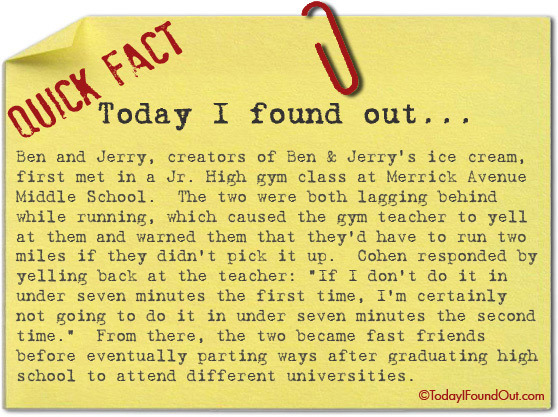 Ben and Jerry, creator of Ben & Jerry’s ice cream, first met in a Jr. High gym class at Merrick Avenue Middle School. The two were both lagging behind while running, which caused the gym teacher to yell at them and warned them that they’d have to run two miles if they didn’t pick it up. Cohen responded by yelling back at the teacher: “If I don’t do it in under seven minutes the first time, I’m certainly not going to do it in under seven minutes the second time.” From there, the two became fast friends before eventually parting ways after graduating high school to attend different universities.